Come & share your thoughts about Death & Life, Decay & Transience, Cemeteries & Art on Saturday October 22nd from 1:00 – 3:00pm. We’ll be working with Artist Maria Gaudin who has focused her art on themes of death & decay in nature & human life. The group will have the opportunity to share thoughts about death from our different cultural perspectives. 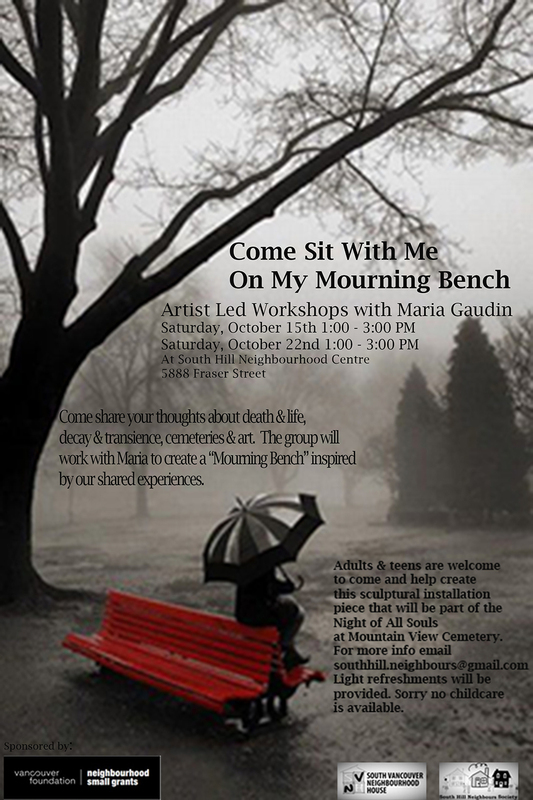 Then Maria will guide the group in using mixed media and wood to create a “mourning bench” – for the Night of All Souls at Mountain View Cemetery on October 29th. This workshop is intended for teens & adults from all different cultural backgrounds. Contact susanff@gmail.com for more info. The afternoon will begin with tea, refreshments & time to share experiences. Thanks to Vancouver Foundation & Neighbourhood Small Grants for providing funds to run these workshops at no charge. This entry was posted in Events, Projects and tagged All Souls, Artist Workshop, Grief, Mourning Bench, Neighbourhood Centre, Night for All Souls, South Hill by Susan. Bookmark the permalink.